This is a recipe I wanted to post a long time ago, back when I'd posted the Chole recipe. They go amazingly well together. I hope you try these out. 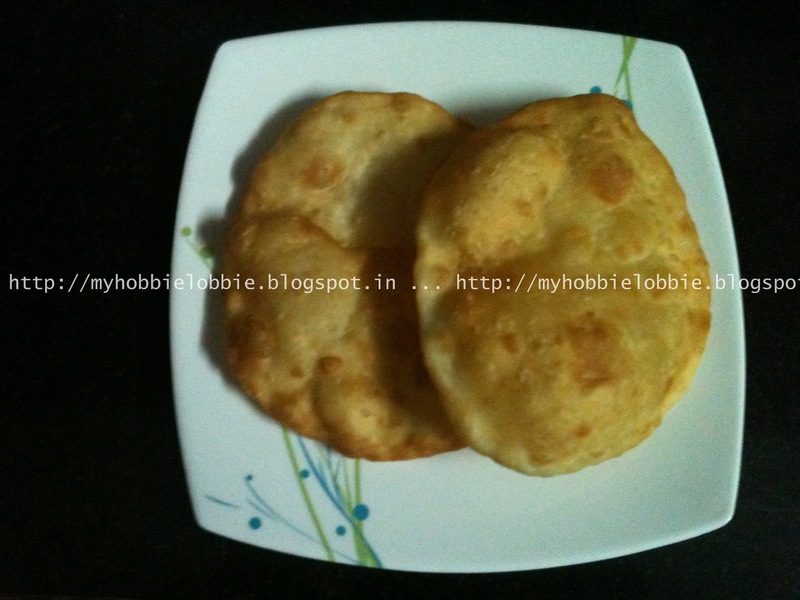 These bhatures are simple to make and are well worth the effort. They look similar to the pooris but are different in taste and texture. We enjoy these so much, we can eat them plain when they're piping hot. Mix the dry ingredients - flour, baking soda, baking powder, salt and sugar in a bowl making sure you mix well. Add the yogurt, oil and enough water to knead into a soft dough. Cover with a damp cloth and let it rest for half an hour. Heat the oil for deep frying and as it is heating, grease your hands and divide the dough into portions the size of golf balls (You can change the size of the portions to suit your liking) and roll out into a disc. Deep fry in the hot oil and when browned, drain on absorbent paper. wonderful and delicious bhature !! This looks so good, I can't wait to try it. Hope you are having a great week end and thank you so much for sharing with Full Plate Thursday. Thanks for stopping by Miz Helen!!! Peas Pulao ... yes please! Chocohotopots ... to the rescue!